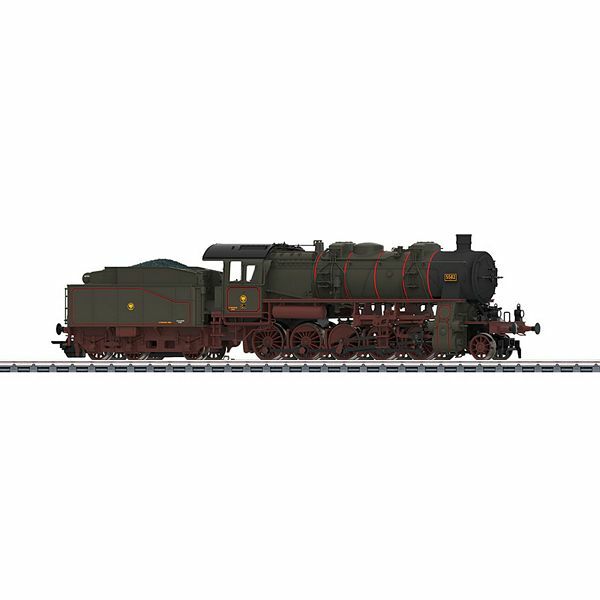 Prototype: Royal Prussian Railroad Administration (KPEV) Prussian class G 12 (later the class 58.10-21) steam freight locomotive. Gas lighting and Prussian type pr. 3T 20 tender included. The locomotive looks as it did shortly after being delivered by Borsig in 1917. Locomotive number 10.282 in the delivery book of A. Borsig Works, Berlin-Tegel. Model: The locomotive has an mfx digital decoder and extensive sound functions. It also has controlled high-efficiency propulsion with a flywheel, mounted in the boiler. 5 axles powered. Traction tires. The locomotive and tender are constructed mostly of metal. The locomotive has dual headlights that change over with the direction of travel. They will work in conventional operation and can be controlled digitally. Maintenance-free warm white LEDs are used for the lighting. A 7226 smoke unit can be installed in the locomotive. There is a permanent close coupling with a guide mechanism between the locomotive and tender. A close coupler with an NEM pocket and a guide mechanism is on the front of the locomotive. An NEM coupler pocket with a guide mechanism and a TELEX coupler is on the rear of the tender. The locomotive has many separately applied details such as piping and sand pipes. Piston rod protection sleeves and brake hoses are included. Length over the buffers 21.2 cm / 8-3/8". A suitable collector's case made of wood and glass with a relief of the characteristic Borsig gates for the Borsig Locomotive Works in Berlin-Tegel is included. An engraved metal sign plate including the builder's number is mounted on the base of the display case. A high quality excerpt from the delivery book is included. Prototypical tooling changes for the Prussian version. Suitable collector's case with a relief for each model in the edition. mfx decoder and extensive operating and sound functions included. An excerpt from the Borsig delivery book included. One-time series (model 4 of 5). Soon after the start of World War I the German War Ministry recognized that the multitude of different steam locomotives not only greatly affected railroad operations essential to the war effort but also the maintenance of the locomotives themselves. The War Ministry therefore requested as early as 1915 the development of a powerful standard design freight locomotive with the smallest possible axle load (16 tons). A commission was formed to complete the plans for this locomotive. This commission had representatives of the railroads and the military. In the end, the Prussian members pushed through the construction of a 2-10-0 hot steam locomotive. At the start of 1917, the Borsig Works were given the contract to generate the design documents for the new locomotive. The new "standard design locomotive" was developed in the shortest amount of time by borrowing from a 2-10-0 locomotive for Turkey. The first units were completed in 1917 and were designated the class G 12 in Prussia, Württemberg, and Baden. In Saxony, the G 12 was designated as the class XIII H. With a boiler height of 3,000 mm / 118-1/8", the Belpaire firebox, and the continuous bar frame these units had nothing more in common with Prussian locomotive building tradition. The low bar frame allowed the firebox to be set on the frame and to be widened on the sides compared to earlier sheet metal frames. For the first time the grate surface could be achieved not only with the grate length but also with the grate width. Other new features were Coale design safety valves as well as a standard design feeder water purifier. Between 1917 and 1921, 1,158 units were built just for the Prussian State Railways and later for the DRG by AEG, Borsig, Hanomag, Henschel, Krupp, Linke-Hofmann, Rheinmetall, and Schichau. The Baden, Württemberg, and Saxon State Railways ordered additional G 12 locomotives. In the DRG plan of 1925 for new class numbers the Baden G 12 units changed to the DRG class 58.2-3, the Saxon G 12 units (sä. XIII H) to the class 58.4, the Württemberg G 12 units to the class 58.5, and the Prussian G 12 units to the class 58.10-21. They were used in almost all of the German State Railroad districts. World War II caused numerous units to be left abroad, such as Bulgaria, Austria, and Poland. The locomotives remaining on the DB were retired by 1953. By contrast, the DR locomotives were indispensable for a long time and ran in their original version in the Erzgebirge region until 1976. Several G 12 locomotives have remained preserved, among them the operational road number 58 311 owned by the Ulm Railroad Fans. Delivery the middle of 2016.